Heat maps are particularly useful to visualise data that vary seasonally. For example, note how the seasonal peak in the Atlantic Multidecadal Oscillation has varied year-to-year in addition to the long-term dynamics of this variable. Time series of phytoplankton also demonstrate the remarkable seasonal dynamics of that variable in addition to longer-term decadal trends. Some of the fish data display remarkable changes over time, for example, with the average sampled length at age 3 of Atlantic herring decreasing from 28cm in the mid-70s to 25cm in 2000 with aparent abrupt changes (1986). 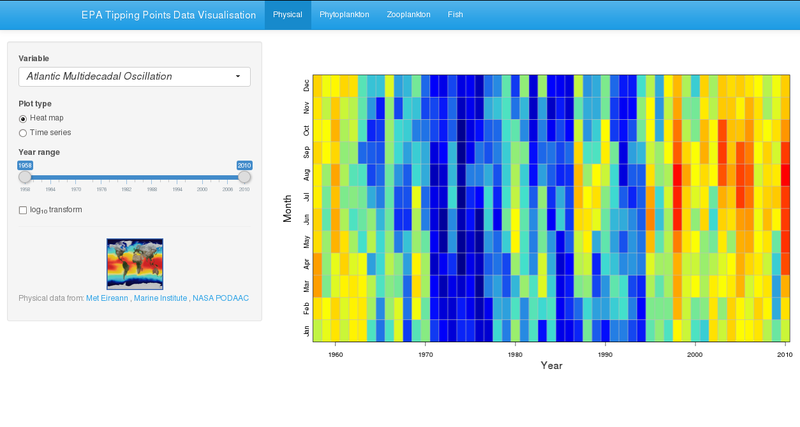 In the next few months we plan on expanding the database to other taxa, find neat ways of visualising many complex physical and ecological time series together. Of course visualisation is important, but we’ll be developing and applying powerful multivariate time series analysis to investigate drivers of observed changes at multiple time scales (decadal, seasonal, abrupt changes). So watch this space!